Journey to the plains of Africa to witness the spectacle of the beautiful and astute animals…competing in their own Olympics. Witness the boxing lions and singing hippos as you sping through reels of goggles, table tennis rackets, whistles and weights to earn the gold medal at the jungle Olympics and receive an exciting cash reward. NetEnt always provides excellent entertainment and engaging games to their players.The company was founded 20 years ago and has become one of the market leaders. NetEnt´s development team strives for revolutionary and flexible digital casino solutions delivering unique games. They offer a long list of different themed games to provide great gameplay experiences to their audience. With innovative ideas and unique game design choices, NetEnt has won several awards for their games. Today NetEnt serves over 170 of the world's most prominent casino operators, developing high-quality video slots. Get ready for the wildest sports competition you have seen in years! Jungle Games invites you to assist to the african animal kingdom and their unique sports event. The set of reels is see through so you can admire the beautiful view of the hot savannah at all times. However this savannah is a little different from usual as it also has a running track on its ground for the animals to compete on. The aesthetics are of a great quality with a smooth stylist art-style. This game will emerge you quickly into its setting with the nice soundtrack and the consistent theme related art. On the five reels and three rows you are introduced to the competitors, a relaxed hippo, a crazy giraffe, a sporty gorilla, a focused rhino and a competitive lion. You can also see their sport supplies a basketball, a whistle, goggles and a towel, barbells, a table tennis bat and ball and some boxing gloves. The gold trophy is the wild of this exciting competition and will replace any other symbol except for the scatter. If you land yourself a gold medal you will have found the scatter of this game. If you land three or more of them anywhere on the reels you will get the chance to choose which game you would like to play as the bonus feature. In the pick win feature you can choose between the bonus win or the free spins. For the bonus win just click on one of the scatter you landed and it will reveal a cash prize you are awarded. If you pick free spins you also have to pick one of the scatters but it will reveal the number of free spins you will get and the multiplier value that will be applied to all wins during the feature. The free spins feature can also be re-triggered. If you got curious and want to assist to the hottest competition of the year you will have to place a minimum bet of 2p or up to 40 pounds. There are 20 paylines and with the scatter features you can turn your spin very lucrative. Jungle Games will offer you lots of entertainment with consistent theme related game elements. The bonus features are engaging and offer a great replay value as they can vary depending on your choices. The art style and soundtrack add a lot to the game feel and will immerse you into this wild competition. 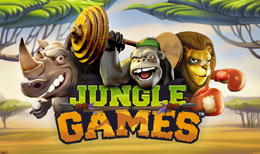 Jungle Games will provide an excellent gameplay experience with great ways to make your game very profitable.